Striker Michael McCrudden has confirmed that he will stay with Institute for the remainder of the season. The Gobnascale man was a target for both Derry City and Coleraine but 'Stute have confirmed the 26 year-old will be remaining with them until the end of the current Danske Bank Premiership campaign. 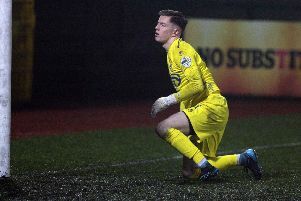 McCrudden, who has netted 19 goals this season and won two Player of the Month accolades, has been a major player for 'Stute over the last 18 months. In fact Paddy McLaughlin's side's form has dipped dramatically since the speculation broke that the Candy Stripes and Bannsiders were in discussions to sign his skipper. Since securing an impressive win at Newry City on New Year's Day, 'Stute have suffered four straight defeats - Warrenpoint Town (Irish Cup), Glentoran, Warrenpoint and Crusaders - McLaughlin also admitted after their league defeat at Warrenpoint that: "Michael's situation has to be sorted and the sooner the better because it's a distraction right across the board, right throughout the club." He went on to say: "As a manager, and I'm sure the players are sick answering the questions about what's going on too. To be honest no one really knows because I'm the manager of the club and I don't know what's going on, so whatever is happening I hope it's resolved fairly soon." The 'Stute captain's decision to stay will come as a big blow for Derry boss Declan Devine, who last week insisted he would love to have the player on board for the club's pre-season trip to Isle of Man. The club confirmed the news that McCrudden was staying via statement this morning. "Institute Football Club can confirm that despite recent interest from a number of other clubs during the January transfer window, Michael McCrudden will remain at the club.